Time for "want-away" players to show some respect? 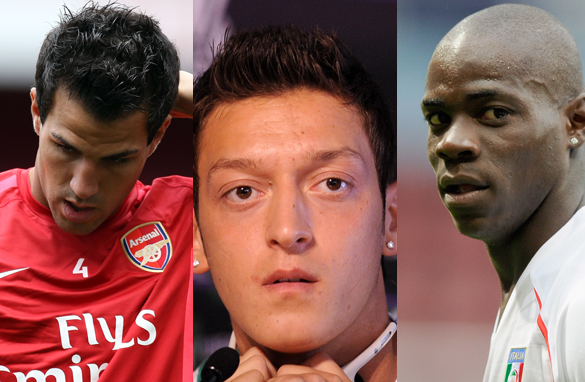 Should Cesc Fabregas (left), Mesut Ozil (center) and Mario Balotelli (right) have shown more respect?. Am I the only one getting tired of all the stories involving unhappy, ungrateful, unappreciative footballers who whine and complain every time they want to change team? The close season saw three transfer sagas filling the front pages of many of Europe’s sports newspapers, and I am honestly bored of them. No prizes for guessing what the first story is. It made the headlines for a solid month and it involved Cesc Fabregas' "dream" to return to Barcelona. Now everyone has a right to want to go home, but let’s take a closer a look at the sequence of events involving the Spain midfielder. When Cesc left the Camp Nou as a 16-year-old kid, he did so because he was promised a bright future at Arsenal and his family were no doubt enticed by the riches of the English Premier League. Cesc left because he wanted to, not because he was forced. Fast-forward to 2010, and it is easy to see that it was a good decision. Thanks to the investment made by Arsenal and manager Arsene Wenger, Cesc has developed into a top player. He is the Gunners’ captain and one of the top earners in the world's most lucrative league. So what has the club got in return? Well, on the pitch, frankly not much; as Arsenal haven’t won a trophy in five years. Off it, Cesc hasn’t had much to offer either. During the months of June, July and August he lobbied, behind the scenes, for a move back to the Catalan giants. Never mind the fact that he still has a contract until 2015. Never mind that his mentor, Wenger, sees him as the centerpiece of a team that can challenge for titles in the near future. On a whim, Cesc decided it was time to go home and had little regard for anyone around him at the Emirates Stadium. Credit to Arsenal, they stuck to their guns and refused to sell their top asset. The club rejected an offer reportedly worth around $50 million from Barcelona. As a result, Cesc now has to swallow his pride, take a long look in the mirror and show love for the club and fans that have always loved him. Let’s move to Italy for another transfer story which had more episodes than a Mexican soap opera. It involved Mario Balotelli. The fiery forward and his agent filled daily column inches, with their incessant pouting and pleading, as they worked on a move to Manchester City. In my mind there was no doubt Balotelli was going to leave Internazionale. Following countless spats with teammates and coaches over the last couple of seasons, he had no chance of staying at the San Siro. However, he should have shown greater respect and gratitude to a club that gave him his big break in Serie A. Before playing at Inter he was a little-known rough diamond; the Nerazzurri played a crucial role in shaping him, a fact which - even with his temperamental nature - he should have remembered. The last saga I want to address features Mesut Ozil, and this one is still ongoing. After a phenomenal World Cup, the young midfielder has been linked with Barcelona and Real Madrid. Ozil still has one more year on his contract with Werder Bremen, but he seems to have forgotten about it. The 21-year-old has repeatedly stated his desire to move to Spain and also expressed his frustration at having to spend another season in Germany. Reading a few quotes attributed to the playmaker, you actually get the impression he is being held at Bremen against his will. Strange, if you consider that over the last two seasons he has been the focal point of the team and repeatedly stated his affection for the side and the city. Go figure. My advice to Mesut and all other players trying to force their way out of clubs is simple: stop and think. Think about how you got where you are and appreciate the role others have played. If you have a contract, honor it, and even if you want to leave don’t whine about it constantly in the press. Be quiet, respectful, and let your agent do his work. You will be respected a lot more. By the club you are leaving and the one you are signing for. Well said Pedro !! These players have to show respect and appreciation. I find the comments on Cesc Fabregas harsh. I don't think for one instant Cesc is ungrateful to Wenger for the opportunity he was given and I'm sure Wenger values Cesc contribution as he is the captain, the centre piece and wouldn't sell him for $50 million. Cesc considers Wenger a second father figure. In Cesc's case he is Catalan, was born as a player in the Barcelona ranks and to criticise a player to want to play in the team he holds in his heart is harsh. For once we have a player who wants to transfer for reasons other than money. And who can blame anyone to want to play in Barcelona, the team displaying the best football in the world and that has names such as Messi, Xavi and Iniesta in its ranks to name just a few. That is just the truth of the matter! I do not totally agree with your article, although the constant complaining of some of the players in the press is starting to get annoying. On the other hand I think it is the right of a player to say he wants to move on to another club. If the player (Fabregas) would be happy with his old club as well he should not complain, but if the player really wants to go, why not selling him? It is more worth to have players who are happy at your club than unhappy players. What do you really expect from a sport that is so degraded that its pampered sissy players need to roll around grabbing their knees in false agony to get points? Ugh, like when Ronaldo left Man Utd like a little brat. You know, just like you would want to change your current job in future, players also change their clubs and want it real bad. This ain't nothing bad bruv. Seconding Joel's comment, this has to be one of the poorest pieces of cnn football journalism i've read. yeah pedro well said men & besides cesc and mezüt and all this guys they think they gone have it easier where all thesuperstars i dont think so!! Haha, 1st comment is spot on. Pedro, it sounds like you are the one that is whinning!! What is the big deal with these guys wanting to move?? This happens all the time, and probably even more so in the Football, Baseball, and Basketball. You would probably do the same if ESPN offered you a better contract. All three players have played several years with their respective teams and have earned their pay, and will continue to give everything on the field for their teams. The idea that they are a bunch of cry babyies is ridiculous. The team owners would not think twice of dumping them if didn't perform since they too are motivated by money. And if the price was right all these teams would gladly let them go. I think you give the clubs a lot more credit than they deserve. Anyone who has ever seen how youth systems and the professional ranks work knows that players are always looked at as assets from a business standpoint: as soon as that asset is no longer valuable, you try to offload it, whether they are 15 years old or 30. Case in point, Fran Merida, whom Arsenal also poached from Barcelona and got rid of as soon as he showed he wasn't what they expected. "Honor the contract" is used all the time from a player's standpoint. But the clubs also sell player when they might not want to go, just as players can force transfers when they want to. Legally the contracts are always honored. Football is a business!!!! Footballers now think most of the time about money!!! the passion for football is still there but its not the most important thing and the love for the shirt they are wearing is false and just a mask! They see a paycheck with more zeros on it and they inmediately change team saying it was their dream to play there. Great article Pedro. Alot of these players have "$ signs over their eyes" so to speak... Their actions show how shallow they are. Seems like the love of football takes a major back seat. Ozil to Man united as well. Actually Özil has said that he wants to stay at Weder until his contract expires. I agree with you. Just one correction about the article: the stadium of Internazionale is "Giuseppe Meazza". "San Sirio" is used when AC Milan is playing. It's the same stadium, but different names depending on who are playing at home. Do you think the same about Cristiano Ronaldo? You had a different stance last time I read about your views on this. Spot on, people in the real world has long since gotten taught the lesson of not mouthing off about their former employee to the new one as the new one will look into the future and see this pattern repeating. Same can be said for girlfriends. It's time this floaters above all learn some basic unwritten rules that apply to all, even those surrounding themselves with sycophants and yesmen. i like this piece. two things come to bare here ; money & past. the sport has been "too" monetised that a player will be forced to"love" the asking club without a doubt. secondly, past. who was cesc before this time ? cesc should appreciate the fact that arsenal made him who he is even when barca 'abondoned' him messi. C ronaldo would have as well go back to sporting , think so . pls show some respect to the finger that is feeding u. This is what happens when you are in a World Cup year. If you play well, you will want to move on to bigger and better things. Money is also a factor although I don't know why Fabergas would be complaining. Right now, Arsenal is more financially stable than my beloved Barcelona, so I'd rather he stay there until Barca gets their house back in order. Back to the point, the only one hurting themselves in this saga are the players themselves. They are the ones who have signed long term contracts with these clubs, so unless they are willing to fork over the money to buy out their contracts they should keep their mouths shut and get on with playing. These guys are 20-23 year olds. What do you expect from somebody that young? For them to even behave the way they're doing is great. Seriously, look around at the 20-year olds you know around you. Does anyone take how they behave seriously? If the fans want respect, they should go look inside themselves. You start feeling insulted because you don't even know does something. We all have to grow up. I can´t believe that a serious journalist write such a childlike tale. The footballers are professional and they can work where they want. Really not, beacause if Cesc,Ozil,... were not great footballers Madrid, Barcelona,... not wanted his service and Arsenal don´t care about if they stay in the Premier or not. gratitude, maybe prefer more money or use a great footballer one year more , that means more money. One year or two or until Cesc get old and them he could go wherever. Andres, I like your post and I agree with you... Good stuff! Pedro, what you seem to miss is that whether you agree with the approach or not, players "whine" in order to get their wishes out in the media to buy leverage. Like Andres pointed out, when it is all said and done, the contracts are always honored. "Giuseppe Meazza" is the actual name of the stadium, while San Siro is only the zone of Milan where the stadium is located. Almost everyone calls it "San Siro" as a nickname but its real name (irrespective of the side that is playing) is "Giuseppe Meazza"
Players are commodities. Clubs and managers show no respect or loyalty to them when they're surplus to requirements, so there's no reason for a player to show any either. Look at Craig Bellamy at Manchester City. An excellent player who curbed his disruptive tendencies to make a big contribution last season. His reward? Being shown the door because Mancini feels he's bought better. Even in your profession it's possible to engineer a move if you think you've got a better offer. Look at Christian Armanpour's defection from CNN to ABC. Even the writer left the network for a while, if I remember correctly. I presume that wasn't because he had a worse offer elsewhere. Players are not whining when they want away, they're just looking out for number one, as does every club manager, chairman, and director in the world. Just because the players happen to earn a lot of money, it doesn't take away their rights. You call it whining, I just call it doing business in the 21st century. 1) Sign a shortterm contract, this way they can take advantage of potential better offers but risk that nobody will sign them after a bad year or a serious injury. 2) Sign a longterm contract, this guarantees the player a steady income for a specific period (even during a serious injury), in return the player should be forced to honor the contract and remain loyal to the club until the contract expires. In my mind this is sport 'politics', its how football players send the message across. Whether its to entice teams, confirm their interest or lack of it...its one sure way to tell other teams how they feel without actually talking to them. Petro Pinto, I couldn't agree with you more. Very well spotted, very well detailed and said. There's no more to add. You said it all. Thank you so much for the insight. Given all the investment, support and sacrifices that their clubs show them, I suppose there's one thing these players ought to know: gratefulness, respect and loyalty to their team, teammates and fans! I find it appalling that these prima donnas who are getting paid way too much money have the audacity to suddenly demand to be sold to another team. Instead of being grateful, appreciative, and thankful for all the money they have earned with their current team, they openly declare that they are longer interested in staying with their team because they supposedly want another challenge. In this day and age where money is hard to come by and especially in the midst of this economic recession, they should consider themselves privileged to still have a job rather than whining about wanting to play for more money elsewhere. It is a disgrace and they should be reminded what it means to sign on the dotted line of a contract. If so many people find these complaining players annoying, why does CNN and other networks keep reporting on them? I'm interested to learn when a player transfers to another club, but I really don't need to know more than that. As for the players, complaining in the media is a very effective way to force your club to look at offers from other clubs, and to get rid of your remaining contract. Mesut Ozil explicity said he doesnt mind staying at the club until the end of his contract, his biggest motivation was to give the chance for his boyhood club to make money off his exit rather leave for nothing at the end of his contract. As far as that goes there isnt a disregard of contract, but what is more important to accept is that these players who want to leave want to achieve better things Arsenal havent won a throphy or even been favorties for one in 5 years this season doesnt look to be different if they get second spot that would be a suprise so why would you not leave the third or arguablly fourth best team in England for the best team in the world which evidence does suggest. Just look at his movites, yes Arsenal gave him the opportunity to be something giving him the status and the wages he wanted. But if passion should rule over money then he shouldnt stay for a minute because he came from the barcelona youth system, born and bred in the city more importantly he has the oppotunity to be the next generation of his boyhood team. Isnt that what we want as a player after all that we go through our professional career to be somewhere which represents us? thats what Barcelona is to Cesc had he gone to Barca when he was 33 would he have the same impact there? As for Balotelli Inter cannot say to a fringe player who was seen as a prospect but was 3rd choice striker that he was being selfish for leaving. Balotelli's off the field attitude isnt exemplary but thats reflects on Inters nurturing of their young prospect. The notorious problems he has caused with the set up at Inter clearly shows an indication of an unsettled player way before the Man City saga. Now, my biggest comment goes to Arsenal, i'd like to throw out a few name... Patrick Viera, Robert Pires, Freddie Llunberg, Sol Campbell, Giovanni Van Bronchurst, Jens Lehmann, Gilberto, Thierry Henry i literally could go on how loyal had Arsenal been to these players when Arsenal decided they were too old after years of service? Theres not much point going further but the evidence speaks for itself on this one. Im afraid football today isnt a game of whingers and spoilt young men thats a very naive thought and although ive mentioned a few examples here there are many many more and i say with great frustration todays football is embroiled in outrageous hypocracy from every angle. Are you blaming Cesc Fabregas for Arsenal's failure to win a trophy over the last five years?! HAHAHA! What have Arsenal got in return for the money they've paid Cesc? Fantastic performances, a never-say-die attitude and a selflessness that deserves to have been met by more ambition from the Board. He's been great and the club hasn't invested in more established players to win things. As for your overall point, players are paid vast amounts and they do complain a lot, but clubs' loyalty to players is equally as thin as players' loyalty to clubs. As for Balotelli, the guy was RACIALLY ABUSED for all of the time he spent playing in his NATIVE COUNTRY. I suggest you research these issues a little more before jumping on the bandwagon of footballers being moaning and boring. Yes for sure these players show a little bit of immaturity and ingratitude along side some disrespect. That's well spotted out Pedro but I think they too have a right to their wants and visions about their futures. Most at times the behavior of this players are their agents are very appalling and uncalled for. Their behavior is poor and the amount of Money their earn is madness. Where will this take Football to?. The bottom line in most cases is money and unfortunately even more money. Most players forget about loyalty. I disagree with you Pedro, do you want to remain in CNN for the rest of your life? no, such is life, if a player flop they put him on transfer, without even teling him,there is nothing like contract in football, if you have contract with a club, and the club have a big offer on you, they transfer you rightaway no waist time, so am on players side, let them go if they have big offer. Unfortunately the rules of soccer itself encourages spiteful, spineless self-aggrandizement as these qualities are rewarded not punished. Hence the constant pretending to be hurt when they're not, falling over when they haven't been touched and going in with the feet. It's a dreadful game. Rugby Union, now there's a game that sorts the men from the boys (and women from girls). Well said Pedro especially on Cesc Fabregas. He was nothing when Arsenal bought him and Barca obviously didn't see much worth in holding on to him back then. But now that he's a superstar, Barca all of a sudden wants him back saying all this time he's really been "on loan" to the UK? Cesc should stop acting like a brat and stop playing the "wanting to go home" card to the sympathies of the Barcelona people. Considering coaches like Capello who tell the media before they tell the player of his sacking, I can't blame players too much. Would it to be better to lie and say "everything is great" then leave? good look at the transfer in this season, i forecast that Cesc Fabregas will not set up in the First team of Barca... he should stay in Arsenal to get the best career and with club to win many champion...don not pay attention about many invited from many famous club you should think where suitable with you and give you successful. the simple fact is that there is no such thing as loyalty any more, only money. if there is a better deal to be had somewhere else, 99% of top players will be off on the next plane. sure, cesc may well have been pressured by his dad, but the timing was disingenuous at best, and disrespectful to all us who pay some of the highest prices to watch him play and line his pocket. All they do , is whine and ? About the money, about the call. I don't blame the player for their action.If a club receives a better offer for a player,they sell that player.So why not a player leaves when he's offered a better contract. For me, it is 50-50 no respect,no disrespect.